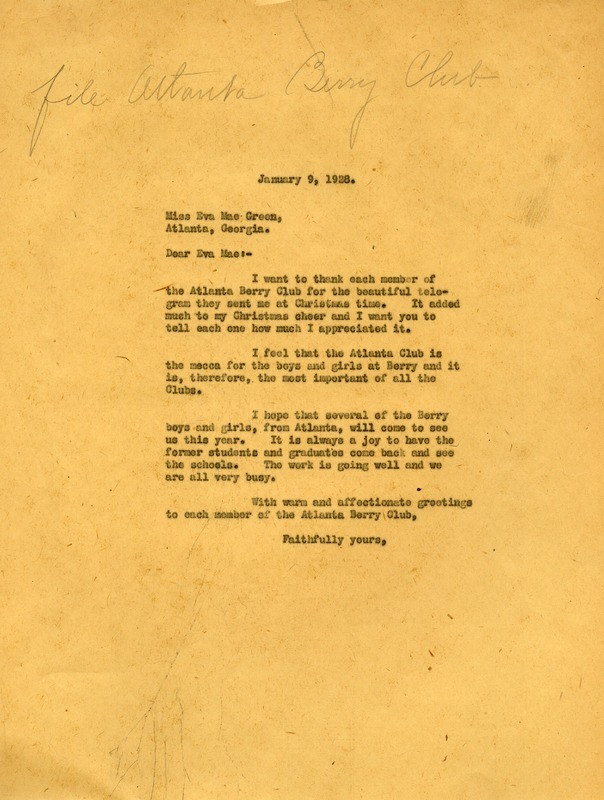 Martha writes to Miss Green to thank the Members of the Atlanta Berry Club for the telegram at Christmas. Martha expresses her gratitude to the Club as the mecca for the students at Berry. Miss Martha Berry, “Letter to Eva Mae Green from Martha Berry.” Martha Berry Digital Archive. Eds. Schlitz, Stephanie A., Jordan Brannen, Aaron Jackson, et al. Mount Berry: Berry College, 2012. accessed April 21, 2019, https://mbda.berry.edu/items/show/6553.